Why James Gudgel DC Chiro-Plus, P. A. "Minimal" wait policy: appointments have priority, but usually we can work in "walk-ins" and unscheduled new patients very quickly. Latest technology in spinal and extremity adjusting: The doctors utilize the Impluse iQ adjusting instrument exclusively. No "twisting, popping, or cracking" of the spine is performed. The patient lays comfortably prone on the treatment table while the doctor performs a series of tests to determine what areas need to be adjusted. Then the spinal areas found to be "out of place" or "stuck" are adjusted with the Impulse iQ adjusting instrument that contains "Auto-Sense" technology. In the nose-piece of the instrument is an accelerometer. This reads movement of the bone. The doctor places the tip of the instrument on the bone that is to be adjusted and activates the mechanism. The instrument will thrust against the bone. Immediately the accelerometer measures how far the bone moved and how quickly it rebounded back. The accelerometer then signals the computer in the handle of the instrument to begin repetitive thrusting as the same frequency that the bone is oscillating. As each thrust is applied, the bone will usually "release" and begin to oscillate faster. The accelerometer reads the new movement pattern and signals the computer to make the instrument thrust faster, in phase with the new bone movement. When the accelerometer has measured three equal osciallation movements of the bone it will stop thrusting and emit a beep. This is the signal that the bone is now moving more freely. 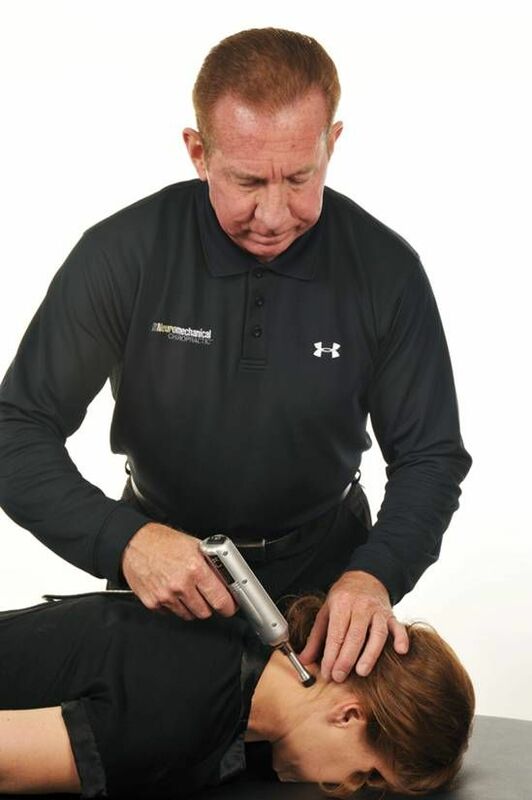 This is a typical adjustment given to the neck for neck pain and stiffness.